Taking courses; Spending thousands on Seminars; Hoarding your Scripts; Organizing your outgoing emails; Listening to Motivational tapes; and even enjoying the company of Real Estate Trainers who inspire you will NOT make you a dime – in fact it will cost you money. So you either get in the ‘Doing Mode’, and then the spending on the above is a Great Investment; or you are wasting away money wishing for miracles that don’t exist. The above trainings and tools help you increase your skill level - NOT close deals; being face to face with clients helps you close deals. 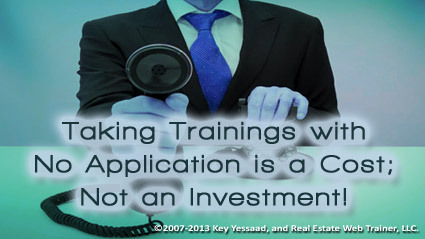 Think of the Skill Level you acquire when you attend trainings and lectures as a way of going from closing 1 deal for every 100 prospects to 1 deal for every 30 or 50; In essence you are learning to double or triple your potential – but it is the activities of Prospecting and Door Knocking, and Calling, and Mailing, and following up that create the conditions for Sales – NOT Trainings!